Two things in life are guaranteed, death and taxes. Well today, April 15, we started a new series; Afterlife: What the Bible says and what we’ve made up. Naturally, before we can really dig into the afterlife we talk about what gets us there, death. Something else that is certain in life, what you believe about death and eternity will affect how you live. Physically speaking, the mechanics of death is simple, the parts of the human body that must function to sustain life simply stop working. Spiritually, death marks the moment when the body and soul separate. Our bodies are nothing more than the vessels we use while on the earth. Upon death, the body is nothing more than a mass of dead matter that is slowly returning to dirt(Genesis 3:19). The soul does not die, it lives on after it is free from the body (Matthew 10:28). The question that has to be answered is where? The answer is determined by the choices made while you’re confined in your body (John 11:26). Even for the Christian, death does not mark immediate transportation into paradise. We will all face judgement. Some will sand before a great white throne for this spiritual review. White is often a color associated with the positive aspects of the Christian faith, but in this case, white is not where you want to find yourself. The souls whose lives are judged in front of the white throne are there because there is no place for them in heaven (Revelation 20:11). These are the people who did not place their faith in Jesus, choosing to trust in their own ability to obtain righteousness. For them, judgement is swift and disastrous. Contrary to popular belief, Christians will also have their lives judged. Not a judgement determining whether they will enter heaven, Jesus already opened that door. This judgement will decide their reward once they enter heaven. What!? We won’t all receive equal pats on the back and “well done good and faithful servant” ego boosters? This passage in Revelation refers to two books being used during judgement. One is the book of life, the other has records of what each soul had done with the life they were given (Revelation 20:12) When a person genuinely accepts Jesus’s sacrifice and resurrection as necessary for their own righteousness, then begins living to emulate Christ’s example of selflessness, their name is recorded in the book of life. Without this record, you doom your own soul to a dreadful eternity in what John could only describe as a lake of fire (Revelation 20:15). So if having our name in the book of life gets us into heaven, what’s the purpose of the second book? Getting into heaven is the goal, right? Wrong, at least not completely. Heaven is where we all want to end up, an eternity in paradise with your creator and savior can’t be bad! Jesus taught us to be more than that, though. His life pointed us to God, yes; but He also showed us how to navigate life, interacting with creation and each other as God designed. He taught us social lessons as much as He did spiritual ones. That is the purpose of the second book, to keep us accountable for how we live on earth. Christianity is more than just picking spiritual sides by saying some magic words and making sure your name is on the guest registry. It is a decision to live a life dedicated to serving other people, deciding everyone else is more important than yourself (Matthew 22:36-40). While the Christian’s entrance into heaven is not dependent on our deeds in life, the reward we receive is. Several places in the Bible speak of crowns some will receive as reward for their deeds (1 Corinthians 9:25, 1 Thessalonians 2:19-20, 2 Timothy 4:7-8, 1 Peter 5:2-4, Revelation 2:10, Matthew 6:20). The Bible also speaks of people who claimed to be Christians but were punished for their lack of deeds (Matthew 25:31-46). My drawing this week is a simple representation of death, an eye closing. I drew an open eye first, using dark, soft lead, then erased it to leave a mirage-like image. Using a charcoal pencil, I drew the closed eye on top. The eye is closed, but the iris and pupil are still visible to show it was once open and full of life. The open eye plays a second role, gazing back at you. The eye looks at you as if to ask, what are you doing with the days you have? Much like my piece ‘Torn’, this one is meant to make you reflect on your own life, inspiring changes as necessary. Tell me, does it work? Inspirational! Thank you. For me – and please take this as coming from someone who has absolutely no eye (no pun intended) for art – the iris and pupil may need to be fainter so when I look at the image, I see more of the closed eye, rather than an open one. Just my meager two cents, but it you’re like me, constructive criticism is hard to find. I can’t seem to get any. Thanks, Jason! As much as I dreaded critique days at ECU, I long for constructive criticism now. Perhaps people hear enough criticism on reality TV they’re spent before they read our blogs! Going back over the closed eye with ink may help bring it to the foreground. 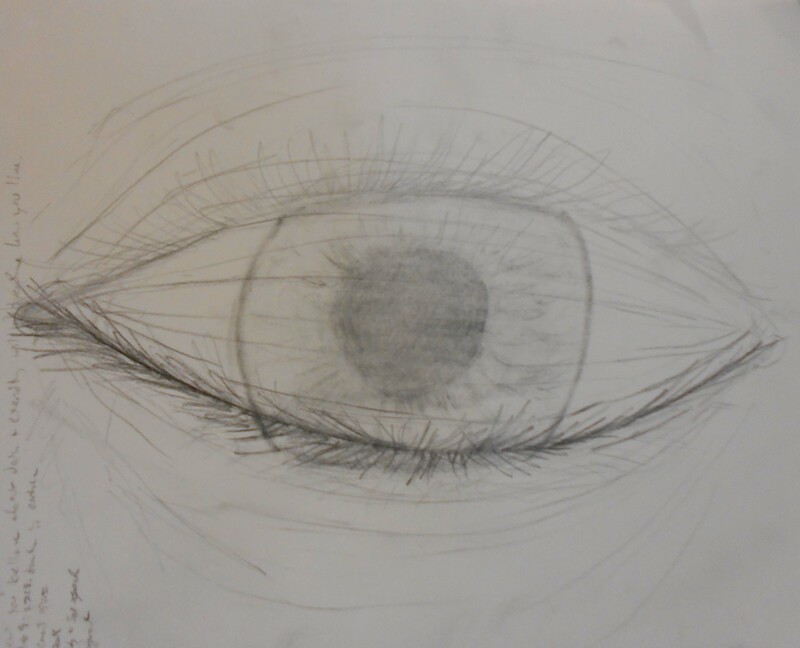 The open eye is the focal point of the drawing, the first thing your eye sees, pushing it to the front. Your mind has to re-interpret the image when you see the closed eye. I’m hoping that will play into the meaning; when you recognize life is fading, you’re inspired to make it more meaningful before it’s gone. Thanks for the “like” on my post. I really like what you have written in your post here (and others on your blog too). That’s exactly what I was talking about. You lay down the facts how you see them, giving us freedom to interpret them as we see fit. Much more convincing than simply stating that all other beliefs are wrong. Good post. I’ll keep an eye out for the ones to come. Thank you for visiting my site and offering such an encouraging comment! My goal is to create compelling artwork and write objective posts while also allowing completely subjective interpretation by my viewers. I’m looking forward to more discussion with you and I hope you continue to connect with the artwork to come! Thank you, I pour myself into the creation process of each piece so that the finished product is a much an object to view as it is a container for my emotions.